First of all, do you realize that it's the 25th Anniversary of Teenage Mutant Ninja Turtles? Because it is. And I can't decide if that makes me old, or if it just makes TMNT all the more impressive. Having two boys in the house, it's hard to find a show that is specifially geared towards them without being overly violent or suggestive. 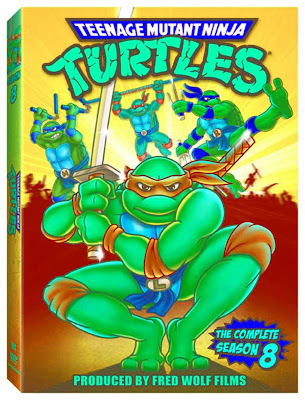 I think TMNT fits the bill nicely, and it's something I can let my boys just sit and watch. It also helps that I grew up with Leonardo, Donatello, Raphael, and Michelangelo and have a particular soft spot for them. I mean, who wouldn't? Human sized mutated turtles fighting bad guys? That is the stuff of LEGENDS people. On this DVD, you get the complete season eight. That's eight episodes of total bodaciousness. The start of fall always brings one thing to the front of my mind. Halloween. I love Halloween, it's my very favorite holiday, and I especially love all the classic childrens movies that go along with it. 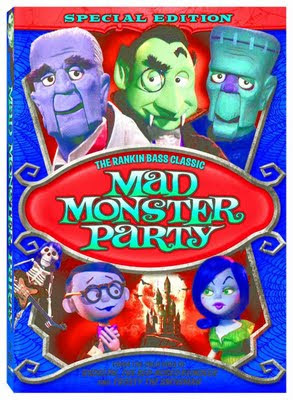 I was really excited to introduce Mad Monster Party to my kids because I fond memories of watching this show with my family. The basic story is simple to follow. Baron von Frankenstein wants to retire as the head of the World Wide Organization of Monsters, but he needs to appoint a successor, and what better way to do it then by having a Mad Monster Party? Mad Monster Party, the beloved animated Halloween classic, comes to Special Edition DVD this September from Lionsgate. Mad Monster Party: Special Edition is a hilariously spooky classic that includes a brand-new retrospective featurette and two fun sing-a-longs... making it the perfect treat for Halloween this year! ALL of my kids are fans of Diego and in this new hour long episode, Diego has to save the baby polar bear. 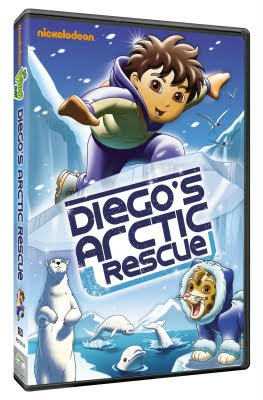 Go, Diego, Go: Diego's Artic Rescue also features two bonus episodes as well as a "Diego's Animal Adventures" featurette. This DVD is debuting on September 15, before it premieres on Nickelodeon. Go, Diego, Go: Diego's Artic Rescue is a great interactive show geared towards preschool aged children. He teaches your kids to use logic to solve problems, to count and match, and introduces them to the Spanish language. If you have a boy between the ages of 6 and 11, you've probably seen at least one episode of the Ben 10 series. Now that Ben is older, he doesn't have his watch that makes him shape-shift, and he's fighting aliens on his own. 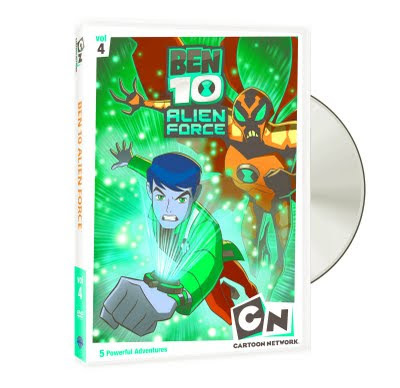 Ben 10 Alien Force Volume 4 will be available on DVD September 1st. This latest release will be stacked full of alien heroes, nasty villains, and a whole lot of action that fans have come to expect from the Ben 10 franchise. In Ben 10 Alien Force Volume 4, not only will viewers see the intrepid trio battle Ben’s evil twin, they will see Ben tackle an even greater challenge…trying to give Kevin dating advice. But armed with his heroic bravery and powerful Omnitrix, Ben can handle just about anything. The DVD includes five episodes from season two, with a running time of 113 minutes. Readers, I have a copy of each of these DVD's for you. How do you enter? Leave a comment. And it would be helpful if you'd mention which DVD you'd prefer to win. Want to get some extra entries? extra entry 4 - Subscribe to The Bingham Diaries by RSS Feed or Email. Contest will close Friday, September 18 at Noon, EST. Winners will be chosen by Random.org so make sure you post your extra entries separately.